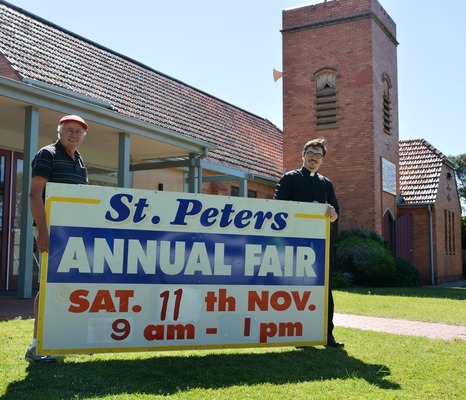 Thousands are expected to flock to St Peter’s Anglican Church in Ocean Grove next month for its annual fair. Fair organiser Bob Fraser said there were “a couple of thousand” at the fair last year and that there was no reason the numbers couldn’t be bigger in 2017. The fair offers heaps of fun for the whole family. Children are allowed unlimited time on the free jumping castle and can join in on the free painting and colouring activities. There will be the usual assortment of lucky dips, toy stall and balloons. Adults can browse the plant stall and everything from flowers, cakes, preserves and jams, bric-a-brac, jewellery, jigsaws and book will be for sale. Members of the Hearts and Crafts group have been busy creating items to sell and there will be plenty of options for those looking to get a head start on their Christmas shopping. Bargains can be had at the trash and treasure with used clothing sure to be a big hit. And of course, a fair wouldn’t be a fair without food and drink. There will be a barbecue and scones. A massive hamper will be raffled off. The fair is on Saturday 11 November from 9am to 1pm at St Peter’s Anglican Church, on Draper Street, just behind Ocean Grove Park.